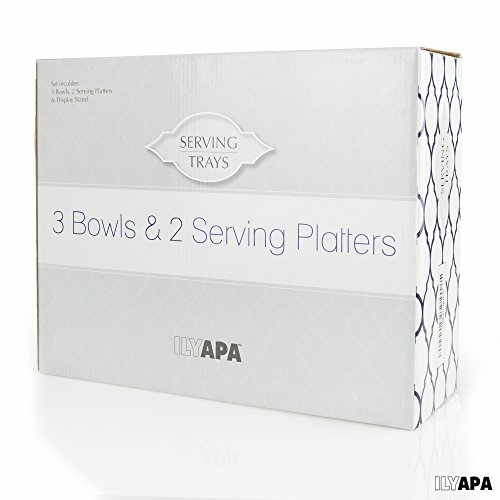 Ilyapa Glass Serving Trays - Multiple Colors and Variations to Choose From! Our decorative two tier serving platter with bowls and tray is beautifully crafted and designed. Impress your guests with its simple elegance and let your refreshments take the spotlight. Bon Appetit! 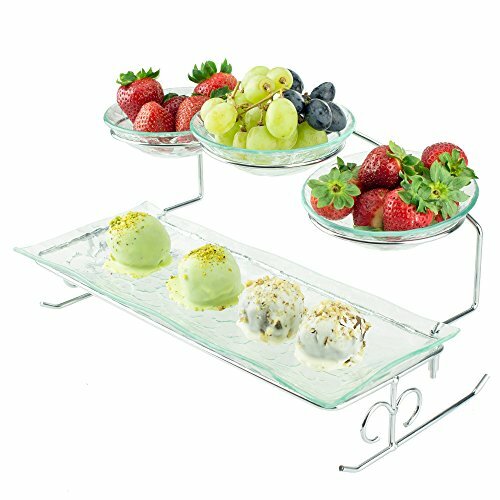 Enhance any special event with this elegant tiered serving tray. It's perfect for birthdays, holidays, parties, reunions, weddings, mitzvahs, formal gatherings, dances, balls, hoedowns, hootenannies, and more. Or get creative and use it as a display stand in your kitchen, bathroom, or bedroom. Comes in gift ready box that protects the serving platter from damage. Whether you plan to serve cakes, cupcakes, cheesecakes, crab cakes, desserts, hors d'oeuvres, veggies, fruits, cheeses, meats, deviled eggs, dyed eggs, cookies, chocolates, or just about any other tasty treat you can think of, this is the tiered serving tray for you. 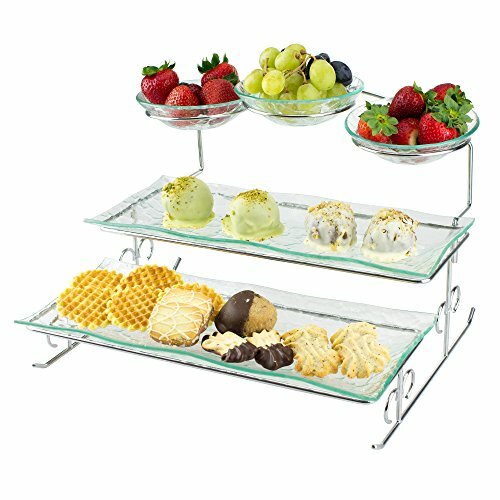 For more party serving options, check out the Ilyapa 3 Tier Server, Ilyapa 3 Tier Server Stand with Trays & Bowls, Ilyapa Ornamental 3 Tier Server, and Ilyapa Serving Tray Platter. Makes great Christmas gifts. 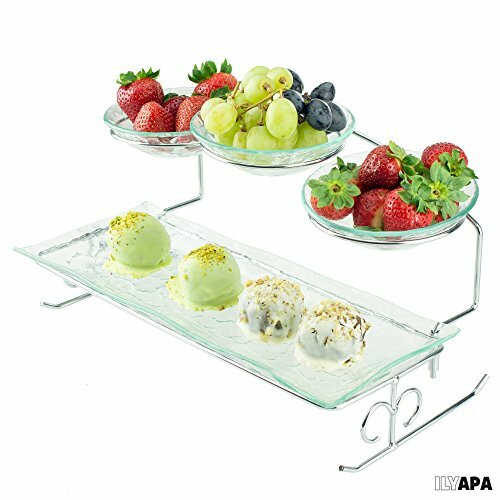 We know you'll love the Ilyapa 2 Tier Server Stand with Bowls and Tray. Click "Add to Cart" and order today! "serving trays for parties tiered server serving tray with stand 3 tier serving tray serving platters and trays 2 tier server tier serving platter tier cake stand tiered serving stand b06xbx1cjt tiered server stand serving tray stand 3 tier serving tray b06xrkxjws wedding cake stand serving trays b01ic3fm6i appetizer serving platters and trays tier stand fruit 2 tier server 3 tier serving platter 2 tiered cake stand for wedding 3 tier 3 tier serving bowls tier platters b000ol5tba b000a7jgbc candy stands for candy buffet fruits platter"
ELEVATE YOUR EVENT - This beautifully crafted serving platter's graceful 2-tier design and elegant textured glass will enhance any event. From dinner parties to weddings, birthdays, holidays, mitzvahs, and more this tiered tray with bowls is the perfect serving stand for any formal or casual occasion.